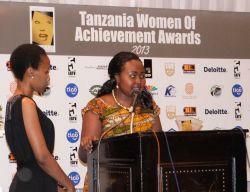 Tanzania Country Director, Glory Matoi, won the Young Achievers Award during the Tanzania Women of Achievement Awards held at the Serena Hotel in Dar Es Salaam last month. The Tanzania Women of Achievement Awards pay tribute to the most exceptional and achieving women in the country who have not only achieved success in their own respective fields but who have made a significant difference in their communities and society as a whole. Glory took over the role of Tanzania Country Director in October 2012. 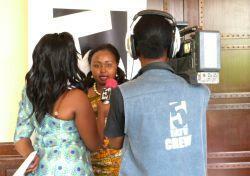 She previously worked as Desk Officer and Program Coordinator after joining Projects Abroad in June 2010. The Young Achiever Award is given to women under the age of 30 who have played a remarkable role within her given field and achieved great results. Glory is passionate about introducing volunteers from all over the world to Tanzania and has demonstrated a sincere commitment to the growth of the offices in Arusha and Dar Es Salaam. The Awards provide a wonderful opportunity to recognize and applaud women who are helping to reshape Tanzania for the better. The ceremony was not only inspirational but the schedule allowed time to make new contacts as well as a chance to enjoy a series of presentations to celebrate successful women. After receiving the award, Glory participated in several interviews that aired on East Africa TV, East Africa Radio and STAR TV. Photos and articles from the event were posted on popular blogs and newspapers all over the country. Congratulations Glory, from everyone at Projects Abroad!